What are Some Treatments for Heel Pain? The heel of your foot absorbs a majority of the impact when you are walking. When you experience pain in your heel, it can be more than a minor ache. Some sources of heel pain can cause intense, sharp, searing pain in your heel and bottom of your foot, making it difficult to put any weight on your heel when standing or walking. Heel pain can even radiate into the back of your leg, or the arch of your foot. 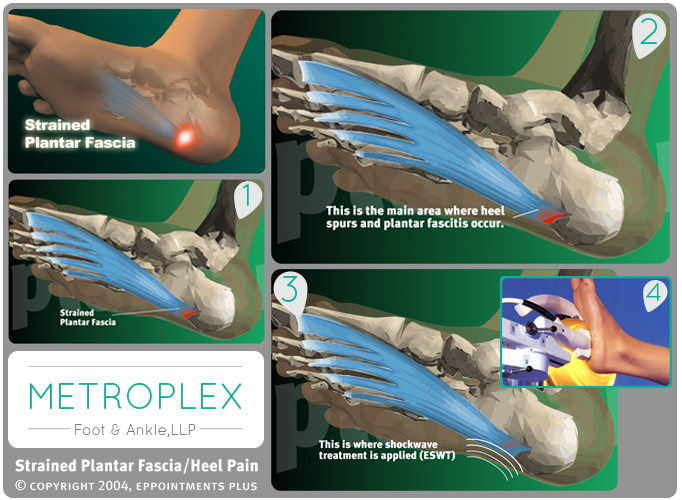 The most common form of heel pain is in the bottom of the heel and is caused by strained or torn plantar fascia. This is the ligament that attaches the bottom of the heel to the base of the toes and acts as a shock absorber for your foot. Tears in the plantar fascia can cause a small spur to develop on the bottom of the heel, but the spurs are not the source of the pain — it is the tears in the plantar fascia. In fact, many people experience heel spurs without any symptoms or pain. If you are experiencing heel pain, contact the Dallas foot doctors at Metroplex Foot and Ankle to request an appointment. The exact source of your heel pain can be diagnosed through a physical exam, and weight-bearing x-rays if needed to identify heel spurs and rule out stress fractures, bone tumors, or soft tissue damage from connective tissue disorders. Your doctor will then prescribe the best treatments for heel pain based on your individual case. Treatments for heel pain vary from aggressive calf muscle stretching to anti-inflammatory medications, over-the-counter arch supports or heel cushions. If these treatments for heel pain do not relieve your heel pain, your doctor may prescribe a night splint, cortisone injections, or orthopedic taping to support your arch. Custom functional orthotic devices may also be prescribed as a treatment for heal pain. These devices are worn within the shoe and provide support to the heel and arch of the foot. 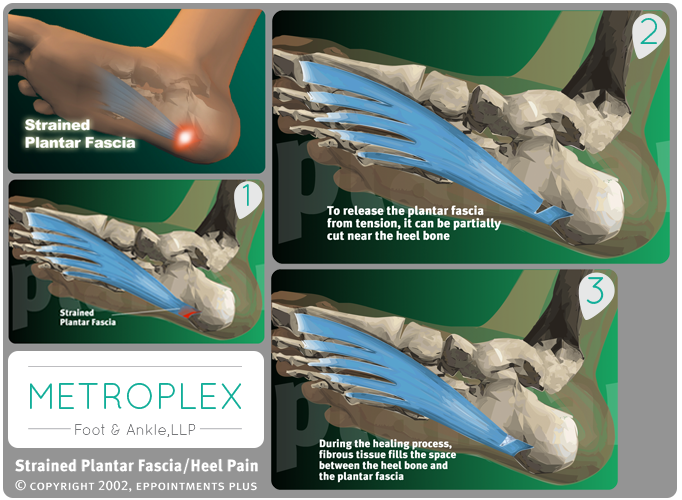 Treatments for heel pain caused by strained plantar fascia also include shockwave treatment that is applied at the root of the plantar fascia, near the heel. Don’t let your heel pain go undiagnosed or untreated. Minor heel pain can intensify until it is too painful to bear any weight on your foot or heel. Before your heel pain gets to this point, make an appointment with the foot doctors at Metroplex Foot and Ankle to find out the best treatments for your heel pain.